Sadly in-game audio is limited to muffled speech and sound effects. I'd at least have liked to hear the gruff voice of the Quarterback calling the play (as heard in the coin-op game). Graphically the game is good, with the robots looking very menacing. American Footy fans and action freaks alike should take a look at Cyberball. Domark's conversion of this superb Tengen coin-op is nearly a brilliant one. I say nearly, because while it features amazing graphics, all the sampled sound and speech of the coin-op (there's loads) and gameplay that mimics the arcade machine perfectly, there's one problem - it plays very slowly. Compared with the arcade machine there's a considerable drop in speed, and consequently play can become frustrating if you're used to whizzing around the field at high speed. If it had been just a little faster Cyberball would undoubtedly have been a C+VG HIT!. As it stands it is an extremely polished and enjoyable game that offers plenty of single or multi-player thrills and spills at a pace that fans of the arcade machine might find just a little too sedate. It's definitely a case of trying before buying. Cyberball's only real minus point is the fact that you can't play against another player - the best that's available is two people playing as a team against the computer. Surely a four-way joystick adaptor could have been put to good use for all the options of the original? Nevertheless, this is a unique, entertaining and satisfying variation on the American Football theme. This is a conversion of the arcade game, and little has been lost in the process - too little perhaps. In the arcade fast action is needed to keep people feeding money in. In your own home there is nobody peering over your shoulder, smoking a roll-up and rattling the chains on his/her jacket (well, if there is they must be related to you). It is a bit of a disappointment that you are only allowed to complete one game, win or lose. There may be more arcade than strategy, but that is not necessarily a bad thing, and at least it is faithful to the original coin-op. Dans l'ensemble un bon jeu, reste à voir s'il plaira au public français habituellement très réticent à ce type de sport. Cyberball offers an interesting alternative to the traditional sports game. There is enough American footy to keep it recognisable, and enough variety to keep it interesting. An ambitious idea which is pretty good fun in the lean period between football seasons. The only problem it really suffers from is a lack of speed. All told it is enjoyable but I can see it growing stale in the not-too-distant future. Neat attract mode with diagrams of various robots, demo game. Slow moving but otherwise a close enough representation of the coin-op. Good title tune with some neat robotic speech, but disappointing in-game silence. It's fun and, for an American football variant, not over-complex... ...but the lack of depth and a competitive two-player option - means the fun won't last that long. Another faithful Tengen conversion. There are some nice effects and bits of sampled speech. The graphics are good too and are very close to their coin-op parent. Fine in both graphics and sound departments. It is not a laster. It will not take long to learn how to beat the other computer teams, which is a shame, things perk up when you play in two player mode – but not enough. A simple, playable and enjoyable game which has been well converted. It is not going to keep you going for months but it is good for short-term fun. Die Steuerung der Robbies erfolgt wahlweise über Stick oder Tastatur, ist aber in beiden Modi gleichermaßen schwammig und ungenau. Da hilft es auch nichts, daß sich die Programmierer in Detailfragen durchaus Mühe gegeben haben - der Robot im Ballbesitz ist gut zu erkennen, es gibt kurzfristig einen Turbo-Schub, um den Gegner stehen zu lassen, und defekte Kampfmaschinen können ausgewechselt werden - mir sind bei Cyberball nach kurzer Zeit nicht nur die Füße eingeschlafen! 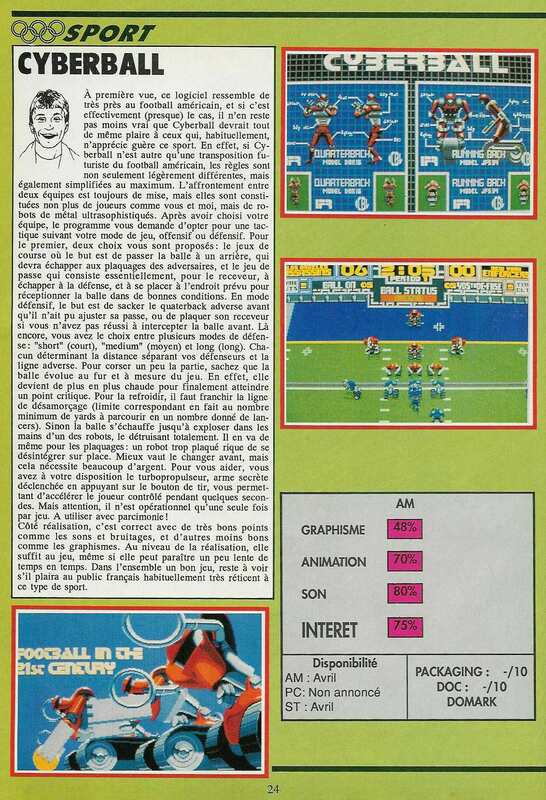 Mit 67 verschiedenen Spielzügen bietet Cyberball viel taktisches Krümelwerk für Football-Versierte. Diese Vielfalt wird ebenso wie die tolle Spielidee von der recht unbefriedigenden Steuerung runtergezogen. Nicht zuletzt wegen dem im Verhältnis zur Spritegröße recht engen Spielfeld ist Cyberball eher ein Lotterie- als ein Sportspiel. Das etwas schwammige Gefühl beim Steuern der Roboter verursacht den dumpfen Verdacht, daß gelungene Kombinationen eher Glücks- als Könnenssache sind. Wer eine ordentliche Football-Simulation sucht, greife lieber zu "TV Sports Football". CYBERBALL ist ein Game unter vielen. Seitens Grafik und Animation gibt diese ungewöhnliche Disziplin nicht viel und schon gar nichts Neues her. Da DOMARK unbedingt mit Roboterteams aufwarten mußte, fällt auch der Bezug zum realen Sportgame völlig flach. Zugeben muß man die nahe Verwandtschaft zum American Football. Diesbezüglich lasse ich jedoch lieber Rost und Staub selbiges bleiben und vertiefe mich in ein echtes Football-Game.